- A vertical down draft flow paint booth. - Control cabinet with logic controller and touch screen. 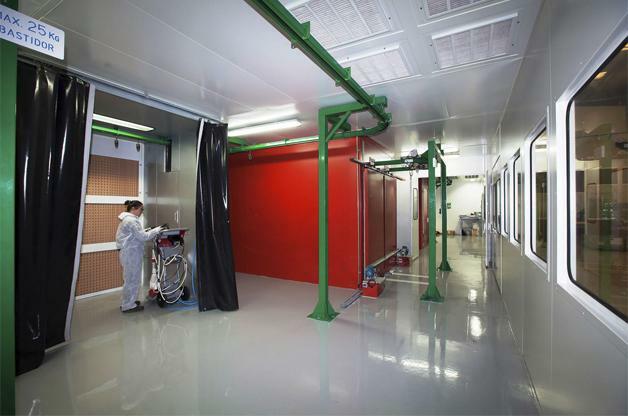 Liquid paint is applied in the paint booth in an over-pressure environment by means of filtered air that after use is then expulsed to the exterior. Both the extraction and the impulsion systems include a frequency converter to adapt to the working conditions. The booth has a double system for dry filtration retention using a system of metal frames for swift and easy filter replacement. The entry and exit gates are made as double doors with automatic sliding opening with a gear motor and limit switches. The parts then go onto a flash off enclosure provided with a filtered extraction system and overhead and intermediate lighting from electronic ballasts. The parts then enter the drying oven at a working temperature of 90° C. Temperature is programmed and controlled by a digital regulator on the central control panel, which shows the interior temperature of the oven at all times, as well as the heating temperature set point. The entrance and exit also include motorised doors, which maintain the heat and minimise the escape of hot air from the inside by means of gauges. The doors are driven by a gear motor and have limit switches. The parts are transported by a Power & Free overhead conveyer made up of two upper and lower rails that can withstand weights of up to 1.500 Kg. per rail and parts of up to 4.000 mm. The entire overhead conveyer system is regulated by a number of limit switches to ensure safe operations with eight stop zones. The parts are automatically loaded and unloaded using an elevator/lowerator that allows the operator to lower the part from the chain to the ideal height for the operator. The installation is controlled by a cabinet with synoptic table in which the elements of the installation and operations are displayed. The cabinet includes a PLC and touch screen to facilitate management and process visualisation.